For those open to challenging ideas, Milo and Julie proved worthy opponents, both consistently drawing applause and questioning the assumptions of the audience. In the end, the real winner was free speech as the event demonstrated the commitment of the campus community to open exchange and disagreement. 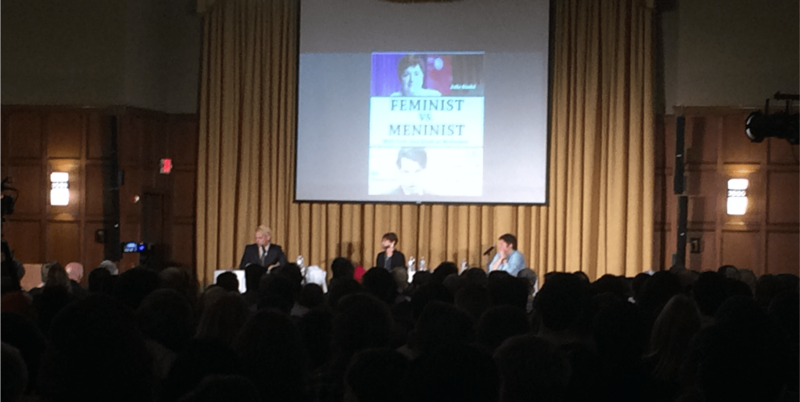 On the evening of Tuesday February 23, provocateur and journalist Milo Yiannopoulos, infamous for starting #feminismiscancer, squared off against women’s rights activist and prominent feminist Julie Bindel in a debate in the Michigan League Ballroom. The debate, organized by the Michigan Review and supported by several other campus organizations, promised to be entertaining and informative; those who waited for a seat in the packed ballroom were not disappointed. The editor in chief of the Michigan Review, Omar Mahmood, introduced the debate explaining that “we will question what no one else will dare question.” Over the course of the nearly two hour debate many topics that are typically taboo in conversations on campus were indeed questioned including feminism and free speech, Islamophobia and social justice warriors. Julie Bindel reinforced her image as a strong feminist and defender of the rights of women and girls. She consistently reminded the audience that the patriarchy is very much alive and well and that women are often subjected to violence and injustice. She also proved that feminists do not have to be humorless as she cracked jokes throughout the evening often to applause from the audience; in explaining her position on free speech, she proudly stated “I am my own trigger warning and consider it an absolute honor.” More importantly, however, Bindel challenged the current brand of feminism which she accused of infantilizing women and branding her as a detriment to the movement. Of course, discussing difficult ideas can be hard and the University of Michigan, wanting to ensure that all students had a comfortable space free from such ideas, operated a “safe space” at the Spectrum Center in response to the evenings debate. For those open to challenging ideas, however, Milo and Julie proved worthy opponents, both consistently drawing applause and questioning the assumptions of the audience. In the end, however, the real winner was free speech as the event demonstrated the commitment of the campus community to open exchange and disagreement. Bravo, U of M! You should be proud. actually, I think Julie said “I AM my own trigger warning,” which is even funnier. GREAT event, great evening, great debate–and can I be so proud of our U-M students for not freaking out like the kids at Rutgers?